Heat coals or gas grill for direct heat. Brush fish lightly with oil; sprinkle with seasoned salt. 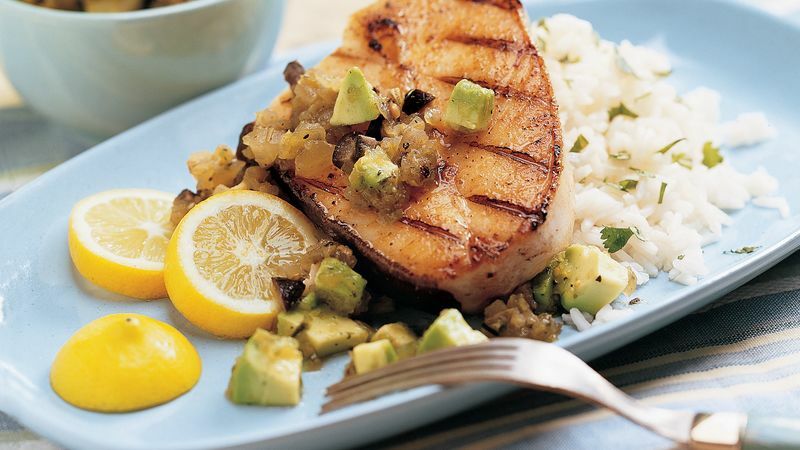 Grill fish 4 to 5 inches from medium-high heat about 10 minutes, turning once, until fish flakes easily with fork. Mix salsa, avocado and olives. Serve over fish. Garnish with sour cream and cilantro. Stir the avocado and olives into your favorite purchased tomato salsa. Any fish with a medium-firm or firm texture like mahimahi, snapper, perch, tuna or swordfish will work fine.